Paradise Green is a non-profit organisation (a company limited by guarantee) run by unpaid volunteers (including the Directors). Our team come from a range of backgrounds. They are united by a shared love of theatre and the performing arts, and offer a wealth of experience and expertise in every aspect of small-scale professional and non-professional theatre. Many of the team have full or part-time jobs in the creative industries. The company was founded in 1997 specifically to run venues at the Edinburgh Fringe. Our aim is to provide the friendliest and best run venues on the Fringe. We strive to achieve the right balance of a relaxed, informal atmosphere and a dedicated, professional approach when dealing with theatre companies and members of the public. We are committed to programming a diverse and exciting mix of theatre, reflecting the best that the Fringe can offer. Our venues have established a reputation for upholding the original spirit of the Fringe, providing a showcase for all kinds of production, ranging from established classics to new writing, and of all sizes from monologues to big cast musicals. 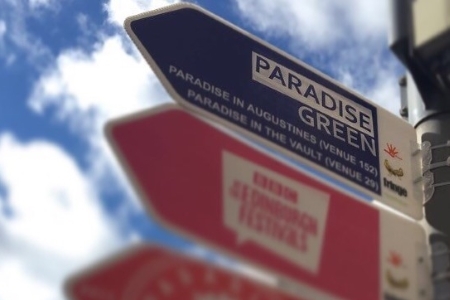 We run two venues, Paradise in Augustines and Paradise in the Vault, both located in the heart of the Old Town, just minutes from the Royal Mile, with ticket sales of 20,000+. We also provide technical services to Venue 40, a single space venue just off the Royal Mile. We ran Greyfriars Kirk House from 1995 to 2006 (at which point the building stopped running as a Fringe venue due to projected redevelopment). 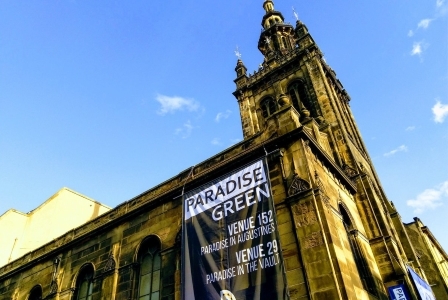 Paradise Green was established in early 1997 to provide a formal framework for the continued success of Greyfriars Kirk House and allow for expansion to other venues. 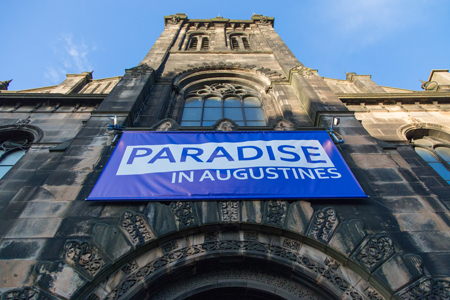 We added Augustine's, now called Paradise in Augustines, in 1998, which houses the Sanctuary and Studio performance spaces and has since become a lively, popular and successful venue with a reputation for award-winning theatre and musicals. We celebrated our 10th anniversary in 2007 by adding The Vault, a new single space theatre, known as Paradise in The Vault during the Fringe. This is a permanent venture billed as the “smallest purpose built theatre” in Edinburgh and, under the name The Vault, it is available for hire for events at any time of the year. In 2008, we added to Paradise in the Vault a second space, The Annexe, just across the passageway from the Vault itself. It is a similar size to the Vault's space, and shares the Vault's box office, snack bar and toilets. This is a more typical Fringe venue, constructed anew each year. In 2015 we started a new project to provide Technical Services to Venue 40 (Quaker's Meeting House). This saw us provide our skilled and friendly technicians to both rig & de-rig the venue and be on site each day of the festival to assist directly with their companies. We look forward to continuing and developing this relationship, and would welcome discussion with other venues regarding providing a similar service. Paradise Green is a not-for-profit company limited by guarantee. The company is owned by the members, all of whom are current and former volunteers. A board of 8 directors are elected by the membership to manage the company.